Location: Lough Gill, in County Leitrim, Northern Ireland. Notes: Rising three storeys tall, in an idyllic setting on the banks of Lough Gill, in County Leitrim, Ireland, Parke's Castle is a plantation era castle. In 1610 Roger Parke completed his fortified manor house on the site of an earlier fifteenth-century O'Rourke castle. He kept the walls of the original bawn - a spacious pentagonal defensive area - and demolished the O'Rourke tower house in the centre. The stones of O'Rourke's tower were used to build the three-storey manor on the eastern side, eventually adorned with mullioned windows and diamond-shaped chimneys. One of two round flankers guarding the north side of the bawn forms one end of the manor. The other end has the gate building with an arched entrance leading into the enclosure. Inside the courtyard are many stone work buildings and a covered well. There is also a postern gate and a sally port; through there are no flankers on the lakeshore. This may be explained by the likelihood that the water level was 3 meters higher in the seventeenth century and would have lapped up against the bawn walls. These waters may have fed the moat that formerly surrounded the bawn. Excavations in 1972-73 revealed the base of the original O'Rourke tower house beneath the courtyard cobbles, and this is now exposed to view. It was in this tower house that Francisco de Cuellar, the shipwrecked Armada officer, was entertained by Brian O'Rourke. In later years, de Cuellar was to write of his host: "Although this chief is a savage, he is a good Christian and an enemy of the heretics and is always at war with them." O'Rourke was eventually captured, indicted and executed for high treason in London in 1591. 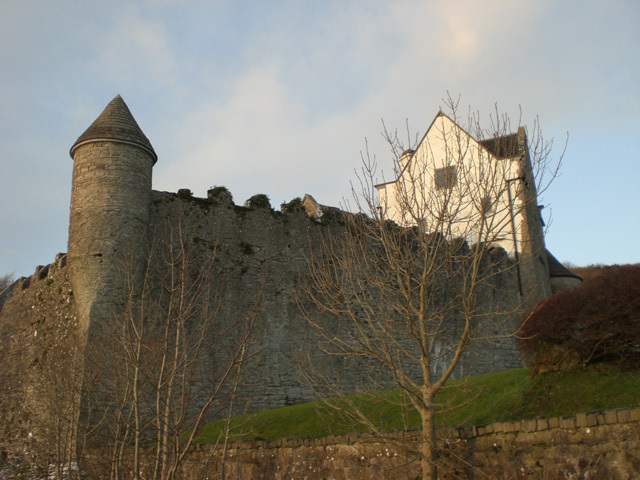 The Parkes, who subsequently acquired his confiscated property, remained at Newtown, or Leitrim Castle - as it was formerly known - until the end of the seventeenth century, when it was deserted. The castle had extensive and sensitive restoration carried out at the end of the 20th century by the Office of Public Works. The window glazing was reinstated, and local artisans restored the timber stair and the mortise and tenon oak roof, using techniques of the 17th century. Parke's Castle is located 5 kilometres (3 miles) NW of Dromahair on the Sligo road (the R286) 12km (7 miles) from Sligo. The castle is open March: 17 - 20, April - June: Tuesdays to Sundays, July to mid-September: Tuesdays to Sundays, October: Tuesdays to Sundays. A small admission fee is charged, granting access to the castle, exhibitions and audio-visual facilities. There is access for visitors with disabilities to the ground floor.